The Primary Drive 520 ORM O-Ring Chain is a premium quality drive chain for motorcycles and ATV’s. 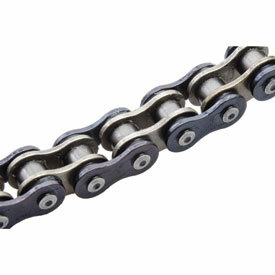 This chain features solid bushings with high quality pin material. The O-rings between the links keep the lubrication in and dirt and moisture out of the moving parts for longevity of the chain. The unique design and profile of the chain ensures durability, and decreases wear on chain guides and swing arm rub plates. European manufacturing ensures quality and attention to detail. The ORM O-Ring chain provides outstanding durability and long wear characteristics making it perfect for motorcycles and ATV’s. Features solid bushings with high quality pin material, O-rings and lubricant. The unique design and profile of the chain ensures durability, and decreases wear on chain guides and swing arm rub plates. Average tensile strength 7,850 lbs. Good chain. Easy to put on with snap on master link. Great chain, after a few miles I adjusted the slack again and it’s holding good. Looks to be quality chain, price is great. Time will tell for the wear factor. Nice good chain. Went on pre oiled and was a breeze to get connected. i didnt expect a lot of life out of this chain because of the price, i was wrong, its held up as good as any big name oring chain ive used over the years. Dont really care for o-ring chains kinda bought this one needing a new chain but it's been great so far. Replaced my old Primary Drive X-ring chain after 2yrs of HARD service. The value and durability of these are fantastic! awesome chain for the price! I love using the primary drive chain. I do 12 races a year and normally just replace the chain once a year. I've been using these chains for years. Great chain for the price. I have been using this chain for many years on my dualsport and racing motorcycles. Great price. Point and last just as long as the more expensive brands. Looks like a well made chain time well tell. I ordered 120 link chain for my 18 fe501 with 14-52 gearing but had to cut out 2 links 118 and I had to adjust it back just a little. The only chain I run. Long lasting, durable, and low price. What else do you need. Have one on an 89 Cr250 and I absolutely love it. 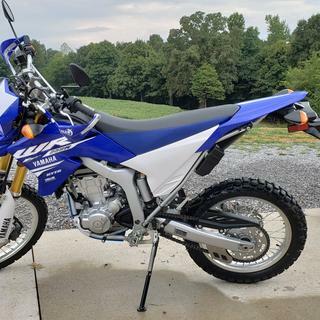 I bought this for my 99 KX250 but the chain would rub on cases. Great product but wish I would have known beforehand. Put 500 miles on this chain and it is still in good shape. that was roughly 25 hours of mixed riding, 80% single track and 20% two track. Great value for the dollar! This chain worked for both of my quads. So far, I had to adjust the chains after the first ride, but that was expected. Good durable chain. I have had problems with the chain being the wrong lenth on a ttr 125 but I just added some of the old chain and used two master links. The ones I got for a couple fourwheelers have been correct. Went from stock 13/43 to 13/47. Bought a 120 link chain so that I would have enough links to use stock chain later on as bike was new. Its only a dollar or so more to have extra links on hand. Chain seems well made. Nicely greased. Comes with Master Link. Easy to install. Can't speak to durability yet. I have about 300 miles on it with no stretch. A good quality o ring chain, works great on vintage and modern bikes, like the price. For the money compared to more expensive chains i think its worth it. Cant tell a difference yet. Cant go wrong with o-ring anything, but primary drive holds up forever! Almost 400 miles of desert racing and still going strong. Good value. Long enough to remove links and install to your needed links. Wears well. Great chain for the value. Haven’t had it on the bike for long but rode a few times with little to no stretch. Durable and inexpensive chain. I use the o-ring chain with a hybrid sprocket...and it lasts me all year long. This chain was easy to install and inexpensive. 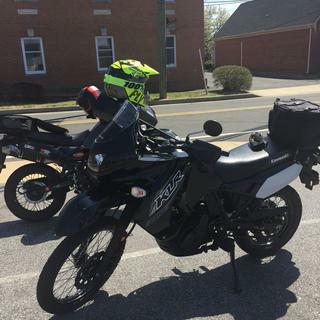 It performed well on a ride last weekend and had no issues. Good chain for the money when you need a inexpensive O-Ring chain. Great chain, fits perfectly, well made and is holding up very well for hard enduro and woods riding. These are my go-to chains on all my bikes now. I keep my bikes clean and lube the chains with quality lube before every ride, I expect them to last a good long time. should a o-ring chain be lubed as much as a non-o-ring chain? BEST ANSWER: Yes. Chain should be cleaned and lubed on a regular basis if you want it to last. Use a good quality chain lube and give it more time to soak in before wiping off the excess. The O-ring chain shouldn't be treated any differently, just lube before each ride. I've gone away from using the specific "chain lube" options and just use WD-40, mainly due to cost. The majority of lubes fling off relatively quickly anyway and I've found wax based lubes can increase wear when mud and dirt combine with the wax and create an almost grinding paste type substance. I oil my o-ring chain after I clean my bike after every ride. I think a lot of people think that they just need to lube their chain right before their ride, but that is false. It's better to lube it way before so that it can soak in. Just remember that lube is your best friend. I personally oil my chain every ride, O-Ring or standard. To me any moving part should have some lubrication. But the O-Ring its self is just a dust seal as well as keep lube inside, but for sprocket to chain and chain performance I would recommend it. I lube mine after every wash which it is washed after every ride so you can say I lube after every ride. Help keep it from rusting. I upgraded from a 13 to 14 front sprocket and 48 to 52 rear sprocket,what length chain do I need? BEST ANSWER: Can"t give you an exact number of links but if it was myself doing this ratio change 3.69 to 3.71 I would order a chain longer than your chain you have now and install it over the new sprockets with considering your chain adj. limits and then cut the length . The small waste of chain is a minimal cost compared to ordering too short of a chain . That's good advice, I'd also say it depends on the bike. I'm running a 13/52 sprocket set with this chain (stock size) and my rear tension block is right in the middle. I have enough adjustment left to put on a 14 front if I wanted. I am running 13-51 on my bike with a 116 link chain. I would go with a 118 to be safe, and cut a link if needed. Get a 110 link chain and you'll be fine. It will be longer then you need but there's no way to count the links unless someone has run your exact setup. I had the same issues with my sprocket configuration. But 110 links should cover you. You are adding 5 teeth. I am not positive but I would think you need to add 5 links. If its too long you can always remove links. Is a chain that is 120 links long actually 121 links long when you add the master link? BEST ANSWER: It's 60 links long 120 pins is what they count so 60x2 equals 120 links with the master link. Hope that helps. I would call the manufacture of the chain and ask them they could give you a correct answer. It comes with the master link, which makes it 120 links including master link. A 120 link chain is 120 links with master link. With my 07 CRF450R entered in the parts finder it gives one length as an option, or a master link. Is this the exact size I need, or will I need a chain breaker because they give a few links extra to ensure the chain is long enough? 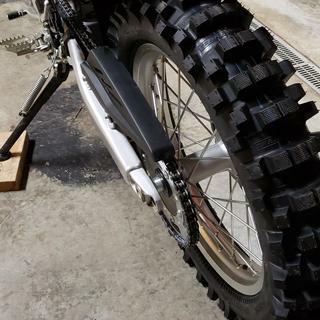 BEST ANSWER: I'm not sure about the CRF450, but this chain was the perfect length for my '02 YZ426f. Look it up too and see if it recommends the same chain - you should be good! Hard to say ,I had to use chain breaker on mine. But I have a different brand bike. Chain wear is great not cheap or shoddy. Will definitely buy another one. No extra links are given. But if u r using a difference sprocket than the factory size. U will need a different lengths chain. It is not the exact size, you'll have to break some links off. With a o-ring style chain is the lube procedure the same as a nonO-ring chain? BEST ANSWER: Less work to be honest. I still treat it the same but the o-rings protect it better so it lasts longer. It says two lengths, the chain then the master link. Does the chain come with a master link or does it also need to be ordered? BEST ANSWER: Yes, it comes with a clip type master link. Much easier to install than the rivet type. it comes with a master link. some people just like to have an extra. Will the 520x96 chain work with a 13 front, 39 rear sprocket combo? BEST ANSWER: Yes, you may have to take a link out like any chain you’ll get but it’ll work. I have a Pitster Pro Thrumpstar, What chain fits the 110 CC??? BEST ANSWER: We do not have Pitster Pro information but what I could find online is a 420 chain. I cannot guarantee it will fit your machine. I would suggest measuring your chain or calling the manufacturer. 2nd owner of an 04 CRF450R. It has a 12t front sprocket and I am going to a 52t on the rear for mountain/trail riding. Will a 520/120 be about the right size chain? BEST ANSWER: OEM gearing is a 13:48 with a 520x114 chain. Since you are one tooth less on the front and 4 teeth more on the rear, a 520x120 will be fairly long. Rule of thumb for gearing/chain length is 2 links per 2 teeth. Following this, you should be able to use a 520x116 without any issues. Do you have the chain color in red ? BEST ANSWER: We do not. is there a rivet master link that I can buy? BEST ANSWER: we do not offer a rivet one i apologize for the inconvenience. is this chain over 15000 lbs tension? BEST ANSWER: Average tensile strength 7,850 lbs. the oem chain length is 94 if i do this will i need a 95 length chain? BEST ANSWER: I'd be happy to look into this for you. What year is your Predator? If you just went from a 14 to a 15 in the front sprocket and the rear is the same, since that is only a 1 tooth difference, you can keep the stock chain size and that will work great for you.